Take in the highlights of San Francisco with a mix of a hop-on hop-off tour, a bike ride, and finishing off with a Bay Cruise. This is the easiest, most convenient way to see the city and you have multiple options to get all of the best views! Enjoy informative commentary and catch beautiful sights of the city whether you're on the bus or biking around. See Golden Gate Park, Fisherman's Wharf, Haight Ashbury and the bustling Chinatown and North Beach neighborhoods. 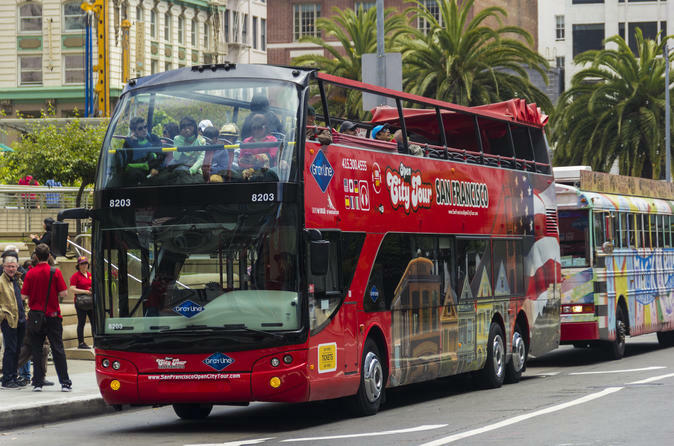 Feel free to hop on and off the double-decker bus or ride a bike as much as you like during your whirl around San Francisco. Simply re-board the bus when you’re ready to go to your next destination or drop-off your bike at one of the designated locations (listed below). Tickets are valid for the Bus & Bike combo for either 24 hours or 48 hours from the time of redemption. At the time of redemption, you'll be given your Bay Cruise ticket which is valid for a period of 30 days so you don't have to squeeze everything in all in one day! All of the buses have enclosed areas where you can keep warm in the winter.